Dora Hidden Letters Dora Hidden Letters Find all the hidden letters in these pictures of Dora and Diego. 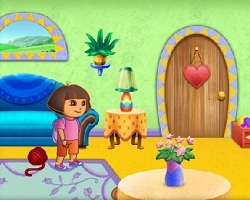 Dora and Boots Dress Up Dora and Boots Dress Up Hi there, it's me Boots from Dora. Today i will join her on our adventure, can you help me dress up? Dora Star Mountain Mini Golf Dora Star Mountain Mini Golf Do you like mini-golf? With this game you can have fun putting on different golf courses. Dora and Diego Adventure Coloring Dora and Diego Adventure Coloring Color up Dora and her cousin Diego as they prepare to go on another adventure. Description: Dora has been eating too much candies. Help Dora get her sparkling clean teeth back! Instructions: Use your mouse to fix Dora teeth problem..